Club Penguin Cheats by Mimo777 Club Penguin Cheats by Mimo777: Club Penguin Bucket Hat Update! Super news for non members! 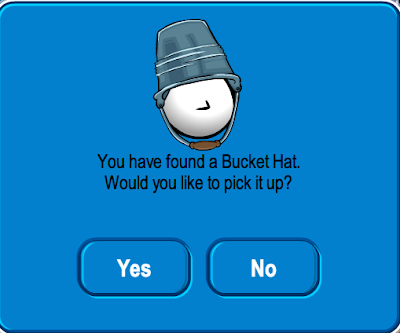 The Bucket Hat is now for ALL penguins! Woot! Yes!!!!! Thank you for the update Mimo! Mimo if you go in the water room in the nija hideout your snowballs are drops of water! cool!! will you have a sensei tracker like rockhopper? 1. The Beatles are back in iTunes. Nope, you dont need it. Hmm...Maybe the ground is to wet. it IS flouded* after all. Im sure Mimo will have a comment tracker soon! hey you guys! if u click on a wall in the underwater parts u walk on it!!! did u notice i think it is pretty cool. Go to the CAVE(swimming pool). Its like the ice rink, but only with water! Has anyone else noticed that in the water dojo the statue is wearing water ninja clothing? Maybe this will be a future interactive item? Who knows? Only time will tell..